The continuing globalization of business and diversifying needs requires that the mutually exclusive objectives of "high quality" and "low cost" be pursued. 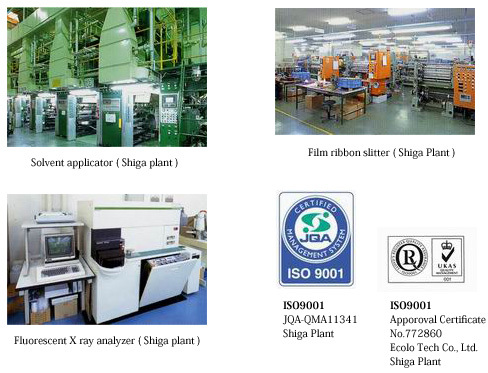 The first and second Shiga plants of General Technology Co., Ltd. and Ecolo Tech Co., Ltd. are equipped with the most advanced technology for high efficiency production, both certified to be compliant with ISO9001 recognized as the world standard on quality assurance with a rigorous quality control system in place to provide high quality at low cost. The year 2005 will see the completion of the third Shiga plant to meet the growing demand for photographic printing. General Group will never stop its earnest approach to manufacturing. Starting with the joint venture company set up in Korea in 1987, General Group has been setting up marketing and production sites one after another across the globe. We currently have such affiliates in 10 locations in 6 countries; United States, Mexico, United Kingdom, Korea, China, and Malaysia to meet the specific needs of each different region. In recent years, efforts have been concentrated on the Chinese sites (Shanghai, Qingdao, Hong Kong, Shengzhen) to promote production and marketing, while pressing ahead with the tripartite trade based around Japan. Such a global network makes its possible to provide the world with the same high quality and consistent supply of products.